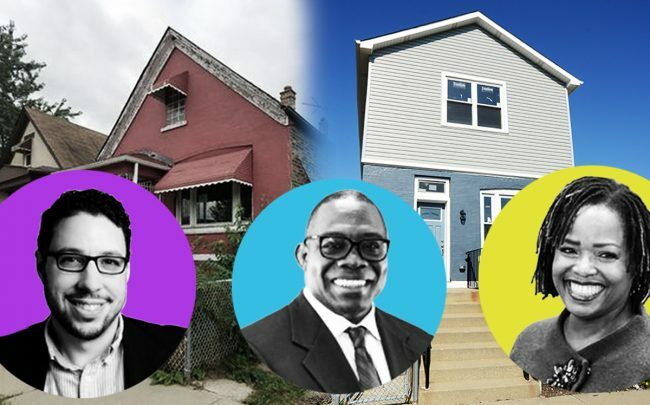 Pacheco, a Baird & Warner residential broker who lives in East Garfield Park, only had finished gutting the interiors last year when an engaged couple found him and offered $335,000 for the house on the spot. The agent wasn’t expecting the early offer, but it fit a pattern, he said. In 2014, Pacheco had spent about $150,000 on his own home nearby, then considered a premium for the West Side neighborhood. “Now, you’re regularly seeing them go into the $400s,” he said. A decade after the financial crisis wiped out home values across the city’s South and West sides, homebuyers and investors alike are putting money into neighborhoods like East Garfield Park, pushing up single-family home prices after years of stagnation. Of the 33 submarkets studied in the Cook County House Price Index, a quarterly report published by DePaul University’s Institute for Housing Studies, seven areas posted a more than 10 percent year-over-year spike in median home sale prices during the second quarter this year. Six are on the South or West sides. Most home prices in the neighborhoods are still far below their 2008 values. But nine years into the recovery, relatively cheap houses have become prime targets for flippers who see shrinking opportunities on the North and Northwest Side. The institute recorded the sharpest percentage gain in the submarket that includes Chatham and Auburn Gresham, where the median sale price rose from about $61,000 during the second quarter of 2017 to $70,000 one year later. A month-by-month tracker published by Redfin shows an even steeper climb: The brokerage posted Chatham’s median sale price this September at $125,000, up from $57,000 in September 2015. Duda singled out Chatham, a traditionally black middle-class bedroom community just south of where the Chicago Skyway splits from the Dan Ryan Expressway, as an example of a neighborhood trying to ride the wave of investor interest. In 2016, U.S. Rep. Bobby Rush shepherded neighborhood and business groups into the Greater Chatham initiative, a collective meant to return “economic advancement and security” to four South Side neighborhoods whose homeowners’ equity was gutted during the recession. The initiative helps home-sellers market their properties to flippers looking for at least an 8 percent yield on their investment, Fears said. Investors had already been scouting those deals in Woodlawn and South Shore, but rising prices are pushing them to look farther south and west. City permit records shows construction activity has been modestly ramping up on the South and West sides, as more property owners and short-term investors put work into new or updated buildings. The city’s buildings department issued about 10 percent more permits in Chatham during the first 10 months of 2018 than during the same period of 2015. The nearby neighborhoods of Auburn Gresham and Grand Crossing respectively saw spikes in construction activity of 14 and 29 percent over the same time. Plenty of homeowners are renovating their own properties, according to Eiran Feldman, whose First InSite Realty owns hundreds of apartments in South Shore and Grand Crossing. But starting around 2013, Feldman started hearing from investors in coastal cities and even some overseas interests who have looked to the South Side for cash-on-cash real estate returns. But Feldman frequently warns outside buyers, especially those looking into multifamily buildings, that they “can’t just waltz in” without proactive management and expect to turn a quick profit, he added. The recent spike in real estate interest is also perking up the antennae of longtime property owners on the West Side, a smaller area suddenly caught between overflowing residential markets in the West Loop and Oak Park. The median single-family home in North Lawndale sold for $148,000 in September, according to Redfin. It was $62,000 in September 2015. Around the same time the Greater Chatham Initiative was gearing up, neighborhood groups in Lawndale began working on their own “comprehensive development plan” designed to draw new residents and businesses to the area. But unlike their South Side counterparts, the North Lawndale Community Coordinating Council isn’t courting outside investors, according to member Richard Townsell. Townsell, director of the Lawndale Christian Development Corporation and chair of the council’s housing committee, said the group is recruiting a homeowners association for “political muscle” to “hold developers accountable” for any construction neighbors don’t benefit from. Residents are especially wary of flippers sniffing out quick returns without a sustained commitment to the neighborhood, he said. But Feldman sees a potential for the rising tide of home values to lift neighborhood homeowners and outside investors alike, he said.